Whether or not you’re a pet lover, pet-friendly buildings tend to be much more attractive to pet owners, and your pet policies may play a significant role in an applicant’s decision to rent from you. 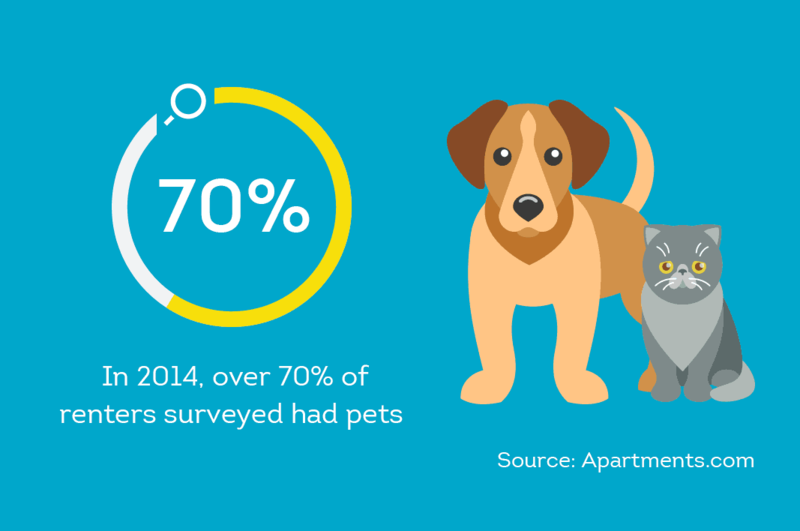 Renting with pets is more popular now than ever; a 2014 survey reported that over 70% of renters had pets, up from 43% just 2 years prior. With so many potential tenants looking to rent from pet-friendly landlords, remaining competitive in your market might mean reconsidering your stance on allowing Fido and Fluffy. As with many rental laws, rules regarding pets vary substantially from state to state. That said, one thing that holds true in almost all states: landlords have some right to prohibit pets, with the exception of service or companion animals. It’s also generally within your right to restrict types of animals, number, or size of the pets you allow (again, this doesn’t apply to service or companion animals). Undecided on whether renters with pets are right for your property? Learn more about the pros and cons of allowing pets in rental properties, and make the decision that’s right for your rental business. Can I Charge A Pet Deposit? Landlords who allow renters with pets often require their renters to pay an up-front deposit to cover any potential damages caused by the pet, known as a “pet deposit”. However, while general security deposits are legal in every state, separate pet deposits are only legal in some. If your state does allow you to charge a separate pet deposit in addition to the security deposit, determining the cost may depend on a variety of factors, including the type of pet, size, and the value of the property. For example, a large dog has the capability of doing much more damage than a small cat, so you may want to charge those two fees differently. Additionally, the deposit required for a high-value property may be larger, as repairs to damage will be more costly than a lower priced apartment. Many states have laws that allow landlords to retain this “deposit” whether or not damage occurs. In these cases, the “deposit” is known as a pet fee. The reasoning is that pets increase the normal wear and tear on an apartment, whether or not they do obvious damage. Pet fees are not legal in every state. For instance, in California, a landlord may only charge a general security deposit and may not charge a pet fee. Additionally, you must determine the cost of your pet fee wisely. As these are not dependent upon documented damage, they must be within reason to cover the additional wear and tear. 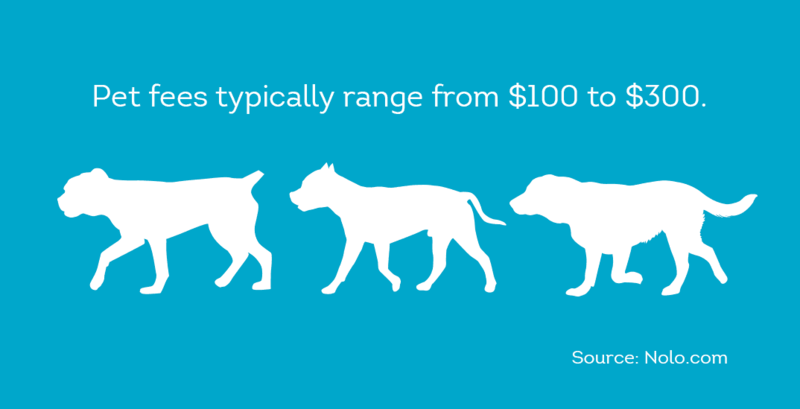 Pet fees are typically priced in the same range as a pet deposit, and may span from $100 to $300. If the fee is too great and a tenant decides to challenge it, a judge has full discretion in enforcing the charge. While pet deposits and pet fees constitute a one-time charge, pet rent is a recurring monthly charge. Just like a pet fee, pet rent is intended to cover additional wear and tear on the unit. It also accounts for damage on the surrounding property, like hallways, common areas, or additional yard maintenance that a pet-friendly rental property may require. Again, pet rent may vary depending on the animal type, size, and number of animals in the dwelling. Prices are typically comparable to pet fees, simply charged on a monthly basis rather than a one-time payment. For instance, a landlord may charge between $10 and $25 per month for a single pet. Over the course of a year, that adds up to between $120 and $300. 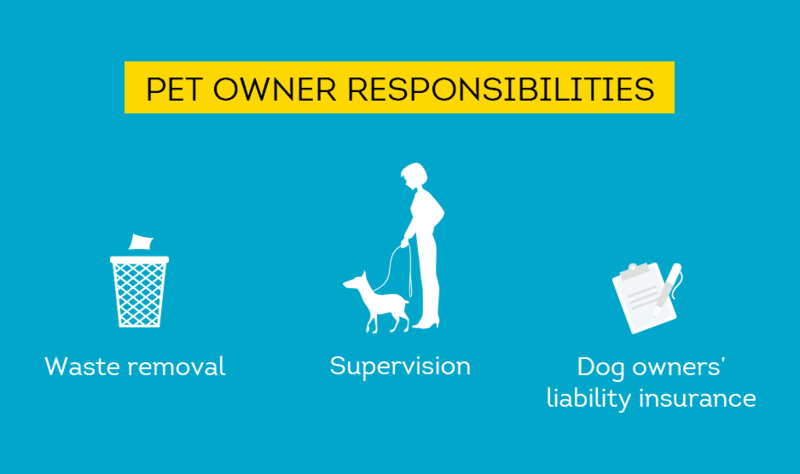 What Are Typical Pet Policies? Pet deposits, fees, or rents cover you financially, but that’s just one piece of the puzzle when renting to pet owners. As a landlord, it’s your responsibility to define proper conduct upfront, so that you can hold your tenants responsible if guidelines are broken. Before a landlord allows pets to reside in their property, the landlord should ask their insurance company about policy coverage related to renting to tenants with pets. Make sure you have coverage in the event of any injuries or damages that are a direct result of the animal. You may also request to see a copy of your tenant’s renter’s insurance (if they have it) to determine if it covers pet-related damages, like dog bites. Whether or not you allow pets on your rental property, it’s vital that you know your tenant’s rental history. Your renter’s past conduct can be highly indicative of their future actions—make sure you do your research to be prepared. Perform a full tenant background check, including eviction history and renter credit reports to determine past renting behavior. Also consider running an income insights report to gain more confidence that your renter makes what they say they make. Analyzing applicant self-reported income against data from the credit report, including how much they pay toward balances, balances they carry, amount of money spent, and other factors, TransUnion can help landlords decide if they should request further proof of income. If you are a pro-pet landlord, an income and credit check may also help you understand whether your renter will be able to afford any pet rent or fees you may charge. SmartMove can help you make the right decision for your rental property—and with online screening that delivers results in minutes, you’ll be well on your way to finding the best tenant for your unit.